Our annual Lacoste Spring Fundraising Program is underway! Our Lacoste fundraiser provides an opportunity for our clients to raise funds to offset their fees. If you would like to help, download the information form and sellers form below. Enter the client’s name you are supporting on the seller’s form. If you want to support The Movement Centre, leave the Client’s Name section blank. 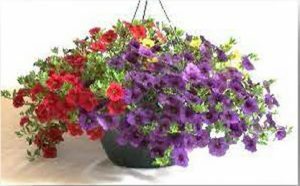 Gorgeous, colourful mixed flower 10″ hanging baskets are $30 (hanger can be removed to create a patio planter). Want to pick up your hanging baskets directly from Lacoste Garden Centre? Get vouchers instead! Gift cards are available in $20 or $50 denominations. If you have any questions please contact Justin or Tamara at 204-489-2679.